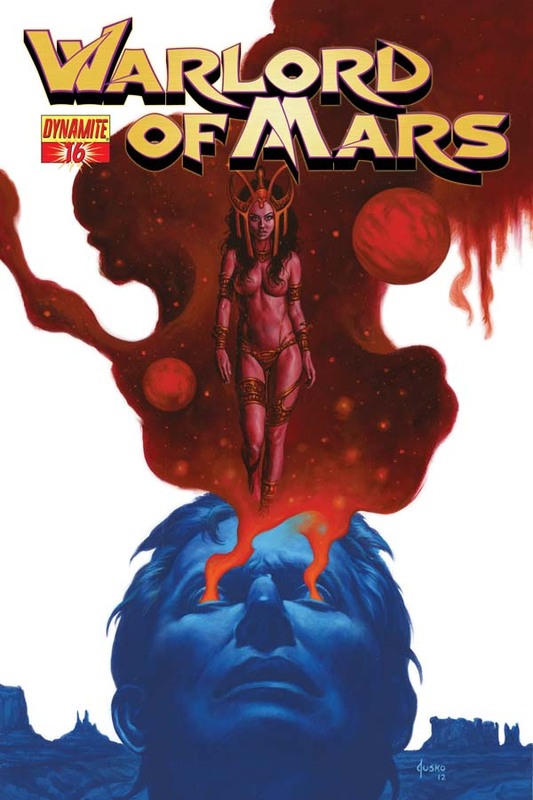 The Fellowship was fortunate enough to obtain a copy of WARLORD OF MARS #16 from Dynamite Entertainment. Arvid Nelson writes, Edgar Salazar pencils, Marcelo Pinto colors, and Marshall Dillon letters. This book is based on the characters by Edgar Rice Burroughs (and the Disney film that just released). John Carter is transported to Mars, which is inhabited by several alien races, and epic fantasy ensues. In this issue, Carter brings down a tyrant and is reunited with a friend just in time to be captured and sentenced to death. This is a fast-paced story; there’s enough here to keep the action moving, and also enough to hint that there’s more going on than we have seen so far. And that’s a good way to create epic fantasy. There are big things happening, both in the foreground and in the background. Mr. Nelson keeps those big things coming and manages to toss in a little humor along the way. I like where this is going. And more specifically, I like where it could go. I’m a big fan of storytelling potential in comics, and I can see much of it here. WARLORD OF MARS #16 is available now at your FLCS or by order from dynamite.net.